Alzheimer’s disease is a neurodegenerative disorder of the cortex. The predominant features of Alzheimer’s disease are numerous amyloid depositions in the form of plaques, vascular amyloid and neurofibrillary tangles. The A4 amyloid peptide is the morphopoetic principle of the amyloid fibrils and the cleavage product of a larger precursor protein. The gene for this A4 precursor encodes a primary translation product of 695 amino acids (Masters et al., this volume). The A4 precursor gene is located on chromosome 21 at the border between bands q21 and q22.1 and much closer to the 21q22 Down’s phenotype region than previously reported (Tanzi et al. 1987). We detected an intragenic restriction fragment length polymorphism with two alleles, the allelic frequency being 0.65 versus 0.35 in Caucasians. This BgL II restriction fragment length polymorphism for the A4 gene was used to track the inheritance of the A4 gene through extensive pedigrees with early-onset familial Alzheimer’s disease and nuclear pedigrees with apparent late-onset Alzheimer’s disease. 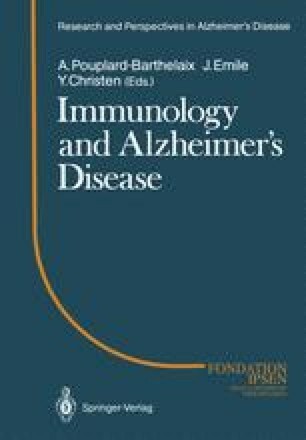 The resulting linkage data showed that the amyloid locus is only loosely linked to the familial Alzheimer’s disease locus and in two families a cross-over was observed (Van Broeckhoven et al. 1987). This and the recent localization of the locus for familial Alzheimer’s disease (St. George Hyslop et al. 1987) indicate that amutation in the A4 amyloid precursor gene is not in all cases the primary defect causing familial Alzheimer’s disease. Expression of the A4 gene is seen in brain, heart, muscle, kidney, adrenal gland, lung, spleen, thymus, testes, and pancreas but not in liver. Using in situ hybridization and immunocytochemistry, we discovered that A4 mRNA is ubiquitous and abundant in gray matter; the protein appears as patches, predominantly on neuronal membranes, suggesting a role in cell contact for the A4 precursor protein (Shivers et al. submitted).